In the 1930s, brother duets were common in country music: Among the better known were the Monroes, the Delmores, the Dixons and the Carlisles. 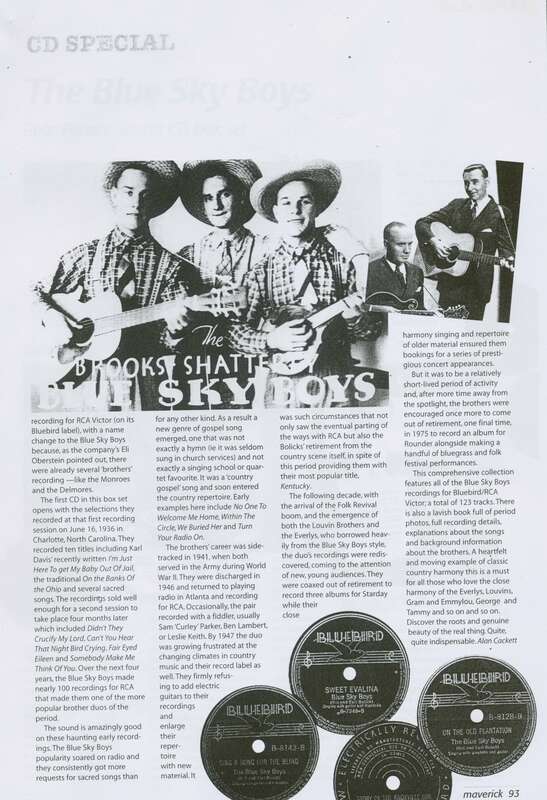 And then there were the Blue Sky Boys, comprising brothers Bill and Earl Bolick.The teenage boys (they were just 16 and 18 when they made their first commer-cial recordings in 1936), purposely avoided the word 'brother' in their professional name. Being from the 'Blue Ridge Mountains, Land of the Sky' they took the two words 'Blue Sky' and so named their act. Pioneers of the family duet sound Bill and Earl Bolick had perhaps the clos-est and purest harmony of all, as they mixed old ballads like Katie Dear with newer songs like I'm Just Here To Get My Baby Out Of Jail into their wide repertoire. The roots of traditional coun-try music rested within rural family circles and the passing down of songs from generation to genera-tion, back in the age when music—along with radio—were, virtually, the only forms of home entertainment. Bill and Earl, were among the first artists to record a specific area of that family sound—close harmony, duet singing. With their intricate yet simple harmonies, their perfectly matching voices, and their unadorned mandolin and guitar instrumental backing, they were instantly quite different from the other brother acts. So much so generations of subsequent duet singers like the Louvin Brothers, the Everly Brothers, Jim and Jesse McReynolds and many others, echo them, some without realising it. Born in East Hickory, North Carolina—the fourth and fifth of six children, Bill and Earl were raised within sternly disciplined, deeply religious family surround-ings and learnt to harmonise by singing hymns and gospel songs at home. They recorded ten titles including Karl Davis' recently written I'm Just Here To get My Baby Out Of Jail, the traditional On the Banks Of the Ohio and several sacred songs.The recordings sold well enough for a second session to take place four months later which included Didn't They Crucify My Lord, Can't You Hear That Night Bird Crying, Fair Eyed Eileen and Somebody Make Me Think Of You. Over the next four years, the Blue Sky Boys made nearly 100 recordings for RCA that made them one of the more popular brother duos of the period. The sound is amazingly good on these haunting early record-ings. The Blue Sky Boys popularity soared on radio and they consistently got more requests for sacred songs than for any other kind. As a result a new genre of gospel song emerged, one that was not exactly a hymn (ie it was seldom sung in church services) and not exactly a singing school or quar-tet favourite. It was a 'country gospel' song and soon entered the country repertoire. Early examples here include No One To Welcome Me Home, Within The Circle, We Buried Her and Turn Your Radio On. The brothers' career was side-tracked in 1941, when both served in the Army during World War II.They were discharged in 1946 and returned to playing radio in Atlanta and recording for RCA. Occasionally, the pair recorded with a fiddler, usually Sam 'Curley' Parker, Ben Lambert, or Leslie Keith. By 1947 the duo was growing frustrated at the changing climates in country music and their record label as well.They firmly refus-ing to add electric guitars to their recordings and enlarge their reper-toire with new material. An was such circumstances that not only saw the eventual parting of the ways with RCA but also the Bolicks' retirement from the country scene itself, in spite of this period providing them with their most popular title, Kentucky. The following decade, with the arrival of the Folk Revival boom, and the emergence of both the Louvin Brothers and the Everlys, who borrowed heav-ily from the Blue Sky Boys style, the duo's recordings were redis-covered, coming to the attention of new, young audiences.They were coaxed out of retirement to record three albums for Starday while their close harmony singing and repertoire of older material ensured them bookings for a series of presti-gious concert appearances. But it was to be a relatively short-lived period of activity and, after more time away from the spotlight, the brothers were encouraged once more to come out of retirement, one final time, in 1975 to record an album for Rounder alongside making a handful of bluegrass and folk festival performances. This comprehensive collection features all of the Blue Sky Boys recordings for Bluebird/RCA Victor; a total of 123 tracks.There is also a lavish book full of period photos, full recording details, explanations about the songs and background information about the brothers.